You can get all technical and compute the correct wire sizes for each circuit. Alternatively, make like I did, and eyeball the existing loom for size. Select slightly thicker wire, remember that the factory tries to spend as little money as possible, so they would use the cheapest (thinnest) wire possible. I tried to follow the Land-Rover colour scheme as closely as possible. Jedelec in Paarden Island supplied the wire in 50m rolls. Obviously I have some left... unfortunately the stripe is painted on, and not moulded in. I added a panel between the steering column and the centre dashboard. On this panel I mounted a rev counter, voltmeter, oil pressure / water temp meter, vacuum gauge, two switches for the wipers and fan, two indicator idiot lights, and a hooter button. Also a couple of spare switches and an idiot light for the immobiliser. The rev counter and voltmeter are from a Citroen GS1220. 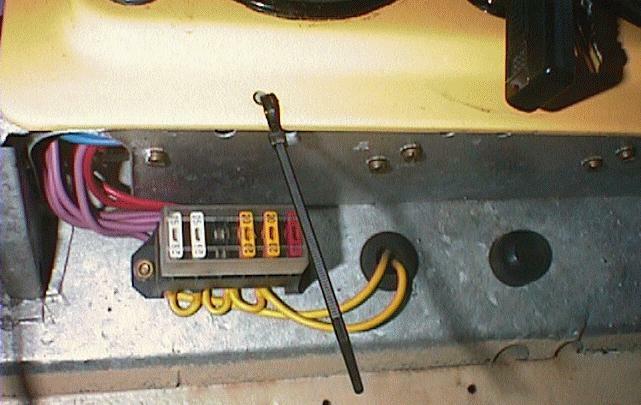 The fuse box is mounted under the dashboard. This is a six position blade fuse holder from Tonnesens. 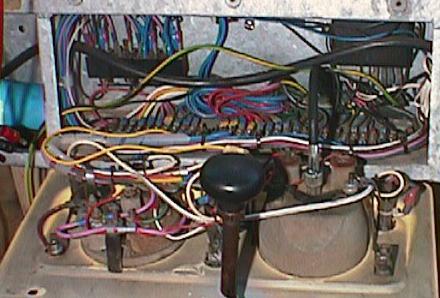 The fuses are, left to right, HOT unswitched (V+), HOT ignition switched (Vign), spotlights, brights, dims, parks. (The spotlights are wired for-but-not-with). The starter button goes to a relay on the other side. You can see the bolts holding the relay, above the red & yellow knobs, almost in the shadow of the gear lever. Also, between the gear lever and the shadow, next to the second curl from the top, you can see a bit of the DPDT switch that switches on the hazards. Do not be tempted to use "chocolate block" connectors, they fail after a short while in automotive applications. Note the four relays in the back left corner. I wired the ignition switch through a relay, these switches were marginal when new and difficult to replace. NOTE: This is not how I eventually wired the car, but it's fairly close.